What a great cover of Sports Illustrated there is this week. I need to get out and pick up a copy of the magazine, but I'll show you the cover if you haven't seen it. 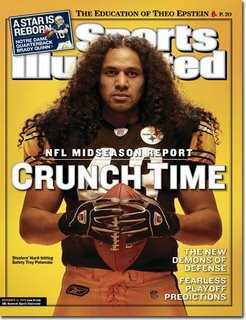 If you have read some of my other entries here, you will know that I am a big Troy Polamalu fan. I think this picture shows the intensity of how he plays. It's one of the few shots that you can see of the Tasmanian Devil standing still! Here is to hoping that Troy does not fall victim to the SI cover curse! !